Figure 2. 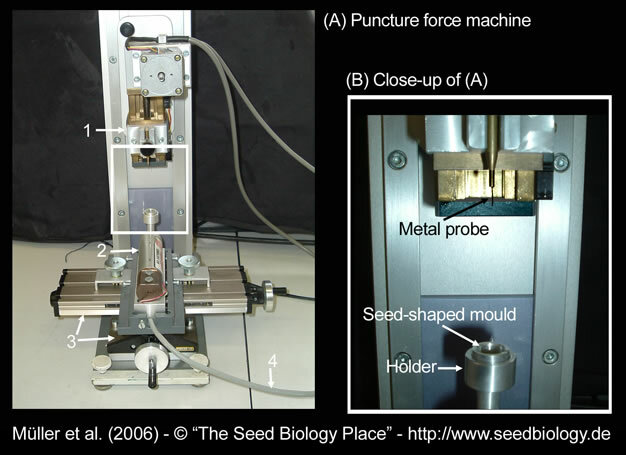 Puncture-force method for measuring endosperm weakening of Lepidium. See also Müller et al. (2006). (A,B) We used a custom-made machine to measure puncture force. Its main elements are labeled in the pictures. 1 = slide for lowering the metal probe, 2 = strain gauge attached to beam, 3 = centering screws, 4 = connection to recorder. (C) Dissected Lepidium seed and puncture-force peaks. For the measurements, Lepidium seeds had to be cut in half and the embryo and remnants of testa stuck to the endosperm cap removed, which left the empty but intact endosperm cap into which the metal probe could be lowered.